During a moment tucked into a rainy drive, soon-to-be big sister Francie and her mother to talk about baby names. A trip, a stop, and a special conversation have Francie dancing with joy. What sweet name could she add to her foggy window family? 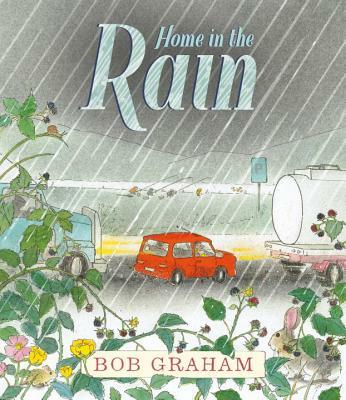 Waiting out a storm by the highway inspires a name for an unborn baby sister in a tender, exquisitely observed tale from the incomparable Bob Graham. The rain is pouring down in buckets, and Francie and her mom are on their way home from Grandma’s. As the little red car pulls into a picnic area to wait out the storm, the windows fog up, and Francie spells out Dad, Mom, and Francie with her finger. But the back window is waiting for another name, that of Francie’s soon-to-arrive baby sister. What should they call her? Francie and her mother ponder this as they return to the road. Later, when they stop to fill up with gas, who will notice one mother lost in thought and a small girl dancing? Once again, as only he can, Bob Graham elevates a blink-and-you’ll-miss-it moment into a sublime tale full of nuance and heart. Bob Graham is the author of many extraordinary and critically acclaimed books for children, including How to Heal a Broken Wing, Vanilla Ice Cream, and How the Sun Got to Coco’s House. He lives in Australia. [Grace is] a name befitting the quiet solemnity of a story that highlights the everyday wonders of human experience, lovingly depicted in Graham's characteristically humorous, soft ink-and-watercolor illustrations. Amazing. Somehow, in typical Graham fashion, all the stories matter, and they all build to a moment that Francie “would remember forever”...The message is clear (see also the John Updike quote on the dedication page) but delivered without sentimentality; and the happy ending—a field mouse safe in its burrow; a hot bath for Marcus; a surprise reunion for Francie and her mom; and sunshine for all—feels absolutely right. The line and watercolor art has Graham’s familiar casual delicacy, with the precise geometry of trucks, road, and slanting rain contrasting with the dishevelment of the car interior, the curly dark blur of Francie’s hair, and her bottoms-up wiggle into the backseat. Viewers will adore the seek-and-find puzzle of matching textual mention to illustrative detail. Graham works his magic yet again. A lyrical and charming tale from an author who specializes in showing the extraordinary in the most ordinary, everyday moments. Perfect for one-on-one and small group sharing. Memorable, expressive characters (Graham has, for decades now, created characters rich in diversity, well before it was a Twitter hashtag) ; a story that makes you think and have all the many feels; and warm, detailed illustrations: this book has it all. Family love, human connection, the natural world, the gift of rain and the gift of grace to be found in quiet moments are all part of this simple, lovely book from an award-winning Australian author-illustrator.